Croatia’s incredible Dimensions festival has added yet another showstopping list of names to it 2018 line-up, with newly announced acts including the mighty Avalon Emerson, John Talabot, rRoxymore, Maurice Fulton and more. Footwork mastermind Jlin also joins the bill along with neo-classical/electronic composer Nils Frahm and new age stalwart Gigi Masin. 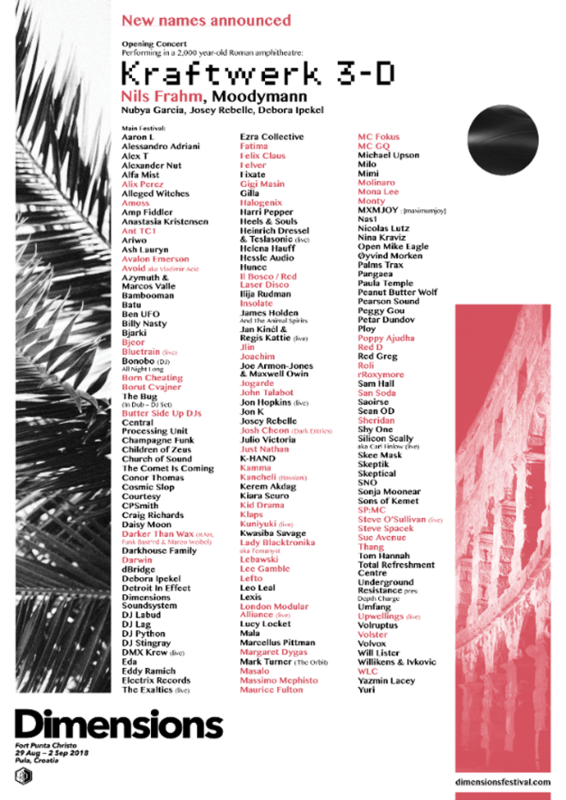 These acts, among the other newly added names which you can see on the poster below, join an already humongous bill for the festival which will run from 29th August-2nd September at Fort Punta Christo, Croatia. Kraftwerk’s special 3D show, Moodymann, Jon Hopkins, Lena Willikens, Ben UFO, Helena Hauff, and Nina Kraviz and DJ Mag February cover star, Hunee just scratch the surface of names that feature on the unmissable line-up. For more info and tickets, visit Dimensions' website. Check the full list of added names along with the entire line-up for the festival below.